XperiFirm Tool makes the tedious task of manually searching and downloading stock Sony Xperia firmware easy. Xperifirm downloads Sony firmware from official servers and there is no chance of firmware being corrupted. 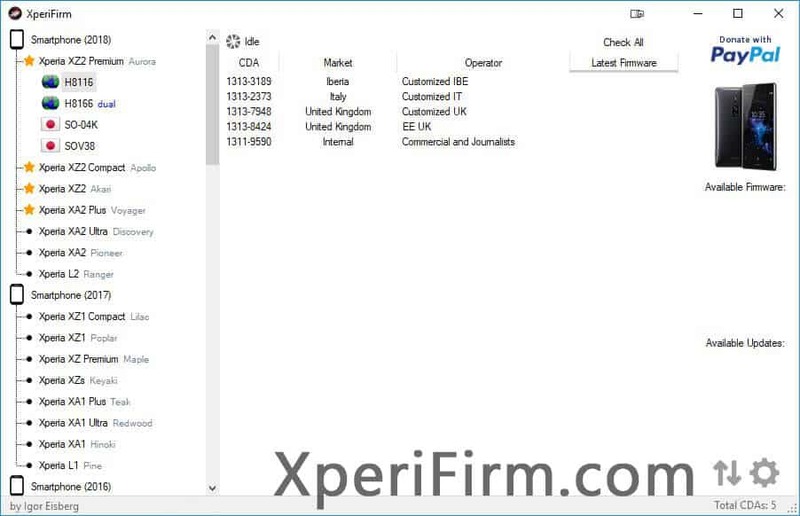 Here on this page, you can download Xperifirm v4.8.0 for Windows 10/7/8/8.1, Linux and Mac. ATTENTION: Installation instructions for machines running Linux were updated! NEW: Adaptations were made to support another server Sony uses to provide firmware, in order to support new firmware released for several devices (like Xperia Z2, Z3, Z3 Compact, Z3+, Z3v, Z2 Tablet, Z3 Tablet Compact and Z4 Tablet) and support for new devices introduced on this other server exclusively: Xperia Z5, Xperia Z5 Compact, Xperia C5 Ultra and Xperia M5. Below you can download Xperifirm v4.8.0 for Windows, Linux and Mac. To use it on Linux and Mac, install Mono on your system (instructions provided below). [*] Always Scan First: We have scanned XperiFirm_4.8.0_(by_Igor_Eisberg).zip before sharing it here. However, we still recommend you to scan the file before using.